Carmelite Circus Giant Real Photo - Entertainers - Real Photo - Vintage Postcards | VintagePostcards.com: vintage, old, antique postcards for collectors. 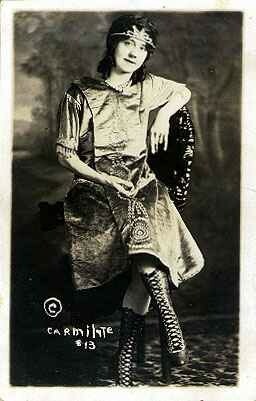 Studio portrait in her circus outfit. Notation on back "Carmelite Horn. 7 1/2 ft. long. Al G. Barnes Show, Age 28 years. From San Diego, California."